Responding to the high importance being placed on digital transformation and disruption, the world’s leading oil and gas event, the Abu Dhabi International Petroleum Exhibition and Conference (Adipec) has introduced an all-new Digitalisation Zone for its 2018 edition. Held under the patronage of His Highness Sheikh Khalifa Bin Zayed Al Nahyan, President of the UAE; hosted by the Abu Dhabi National Oil Company (Adnoc); and supported by the UAE Ministry of Energy, the Abu Dhabi Chamber, and the Abu Dhabi Tourism and Culture Authority, Adipec will take place from November 12 to 15, at the Abu Dhabi National Exhibition Centre (Adnec). The International Energy Agency has estimated digital technologies could cut oil and gas production costs by between 10 and 20 per cent, but industry trials suggest bigger results are achievable. Chief Executive Officer of BP Bob Dudley told the Financial Times a pilot project to apply data analytics to some of its wells has resulted in a 20 per cent production increase. The BP Technology Outlook 2018 predicts the application of digital tools, such as sensors or internet of things (IoT), supercomputing, artificial intelligence (AI) and robotics, all supported by cloud technology, could reduce primary energy demand and energy system costs by 20-30 per cent by 2050. Adipec's new Digitalisation Zone, supported by tutorials and conference sessions, is designed to help the oil and gas industry understand how digitalisation can transform the performance of their assets. “What we observe is that while executives might name one area as most affected by digitalisation, they also tell us that every aspect of oil and gas operations will see some degree of change,” said Jean - Philippe Cossé, vice president of dmg events, which organises Adipec. Change will be felt across the full oil and gas value chain. For upstream production, digital initiatives have significantly increased production, improved well construction outcomes, cut operational costs, reduced non-productive time and decreased capital project completion time. In downstream industries – such as refineries – maintenance and reliability, production planning and scheduling, production execution, as well as health, safety and environment (HSE) are the areas that will experience the most positive impact. Between the two, the midstream sector is reducing repair and maintenance costs, including the deployment of 3D printing technologies, while sensors (IoT), drones and robotics can help improve pipeline inspection and prevent leakages. 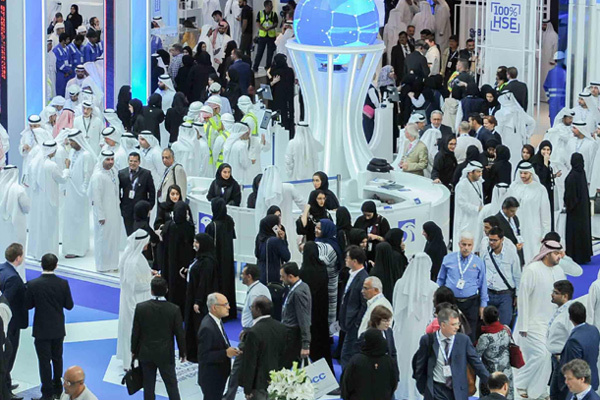 Digitalisation will also feature within Adipec’s highly respected conference programme, long-recognised as the premier meeting place for energy ministers, global business leaders and C-suite executives from the world’s oil and gas giants. New conference sessions will include discussion of how oil and gas can learn from other industries to accelerate digital transformation, trusting data-driven decisions, the potential for Artificial Intelligence and robotics to transform supply chains and asset tracking systems, and where legacy platforms fit into the picture. The focus on digitalisation will be headlined by a keynote address from Omar bin Sultan Al Olama, Minister of State for Artificial Intelligence, UAE. Panel discussions and on-stage interviews will feature some of the industry’s most influential digital thinkers and decision-makers, bringing diverse experience from across the industry. Speakers include C-suite executives from NOCs, IOCs and other oil and gas businesses, including Adnoc; Saudi Aramco; Petronas; Gazprom Neft; Total; Pemex; OMV; Baker Hughes, a GE company; Weatherford; Wintershall; and JOGMEC. The technology and consulting sectors will offer representatives from Microsoft; IBM; SAP; Siemens; Aveva; ABB; Accenture; and PwC.